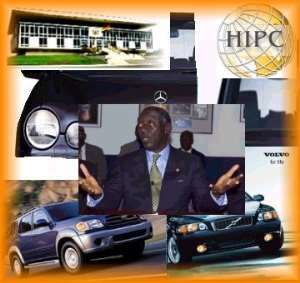 ...About $4,500 of $20,000 Paid So Far ... CHRAJ Evasive On Enforcing Ruling on MPs Car Loans Parliament has indicated that outstanding payments from the $20,000 car loan granted MP's will be paid as soon as the Hesse Commission set up to work out the MP's remuneration submits its report. Public Affairs Director in parliament Jones Kugblenu says until MP's salaries and conditions of service are determined, the directive from CHRAJ for the payment of the car loans cannot be honored. Government suspended the monthly car loan deductions from the salaries of MP's in October last year pending a review of their salaries. This followed complaint by the MP's that they would not be able to repay the car loan by the end of their four-year term, unless their $300 monthly allowance was reviewed upward. Asked about how much of the $20,000 each MP had paid before the suspension, Mr Kuglenu said on an average scale, the MP had been able to pay about 40 million cedis out of the $20,000. Asked again about how soon the MPs would be expected to pay the remaining amount, he said the government had set up a commission to determine their salaries and end-of-service benefits among others and that as soon as the Commission finishes its work, around January 6, the MPs would then be fully resourced to pay the loan. Mr Kuglenu said the MPs are not running away from paying back the loan, but when deductions were made from their meagre allowances, they realised that it was not in their favour and called on the President to set up a commission to determine their salaries, adding that for the first two years they had been paying from their allowances. CHRAJ Evasive On Enforcing Ruling on $ 20,000 Car Loans For MP's The Commission on Human Rights and Administrative Justice, (CHRAJ) is tight lipped on the next step after its report on the controversial $20,000 car loans granted Members of Parliament. Under the mandate of the Commission, parties whose cases have been ruled on are expected to respond within a period of three months. Upon failing to do this, CHRAJ has the right to commence enforcement procedures. But in the parliament car loan saga, three months has elapsed ever since CHRAJ issued its report on the matter yet nothing has been heard from parliament. A number of people are wondering whether or not CHRAJ will put in motion its enforcement procedures. But when the question was put to the Acting Commissioner, Ms. Anna Bossman, she told Joy News that the Commission is still waiting on parliament to issue a statement on the matter. The apparent stalemate between CHRAJ and the Legislature is being considered on the grounds of principles under the current democratic dispensation. But some observers believe that the loans issue cannot be discussed in isolation of the generally poor working conditions of the MPs. This argument is supported by the executive director of the Centre for Democratic Development, Professor Gyimah Boadi . He said in fairness to the state and to Ghanaians and in pursuit of democratic governance, parliamentarians have not been treated fairly in the face of their meagre allowances. “We all know that the conditions of service of Parliamentarians are atrocious and there is the need to address the problem”, he said. He said left to some of them they would not have collected the loan but stated however that a loan is a loan and should be paid back unless there was an official position on the loan giver to forgive the loan. He said as far as he was concerned the people of Ghana have not made a statement to the fact that MPs should be forgiven the loans they contracted for the cars.